Saturday [November 3, 2012] marked the ten-year anniversary of the largest quake to hit the U.S. since 1964, and the 1906 SF quake before that. The M7.9 Denali earthquake tore a ~250 mile gash through Alaskan glaciers and pine forests along the Denali Fault, which runs beside the eponymous mountain also known as Mt. McKinley, North America’s highest peak. Much like the Haida Gwaii earthquake last week, the Denali quake shook mainly sparsely populated areas, so it was much more probable that anyone feeling it would be on the outer fringes of the shaking from the massive temblor. Indeed footage from a home in Anchorage, 160 miles from the epicenter, shows slow rocking–that telltale sign that some place moderately far from you is really getting hammered. Despite the low frequency of the shaking in this video, its strength is clear, and it lasts a very long time–another sign that you’re on the fringes of a huge earthquake. One of the many legacies of this earthquake was that it put the trans-Alaska oil pipeline to the test. The pipeline crosses the Denali fault nearly perpendicularly, and was constructed with the knowledge and anticipation of offset along the fault. For ~1,000 feet on either side of the fault, the pipeline’s supports rest in tracks that allow it to shift laterally and bend as the ground beneath it carries the tracks in opposite directions. The structure was designed anticipating an earthquake of magnitude 8.0 with 20 feet of coseismic lateral displacement. At nearly the anticipated size, the Denali quake was a resoundingly successful test of earthquake engineering, which spared us an enormous environmental disaster. A comparison of the 2002 Denali and 1857 San Andreas fault ruptures. The modern recordings from Alaska help guide our expectations about a contemporary repeat of the southern California quake. Both its size and its geometry suggest that this rupture may be an excellent modern analogue to the earthquake that ripped along the San Andreas Fault in 1857, before southern California was heavily populated. It thus serves as an excellent source of modern data (seismic recordings, satellite imaging, GPS velocities) to help understand what a repeat of the San Andreas rupture will be like. For example, seismic records from the Denali quake are used in structural engineering tests of seismic safety design, simulating the type of shaking that may be expected around Los Angeles in the next SAF quake. The USGS hosts a great set of photos from the spectacular Denali fault rupture, including offset glaciers, newly formed waterfalls across the scarp, huge landslides, and my personal favorite: this unfortunate tree that was growing directly atop the fault trace and got sheared in half. A tree, taking advantage of the groundwater source along the Denali fault, suffers the consequences of its opportunism. Photo credit: Peter Haeussler, USGS. On Friday, February 10, the journal Science published our paper on deformation caused by the M7.2 El Mayor-Cucapah (EMC) earthquake of April 4, 2010. The data we present is the first of its kind at this scale and scope: we have both pre-earthquake and post-earthquake high resolution topographic surveys that cover virtually the entire fault rupture, all 120 km of it. We used both to calculate the topographic change resulting from this large temblor, and present the results in this paper. The widely publicized oblique view of the post-earthquake topography is colored by direction and amount of vertical motion caused by the earthquake. Blue is down, and red is up. Gradations from light to dark blue represent sagging and warping of the ground, distributed deformation that is not evident without a comparison to pre-quake topography. My field photo at right shows a ground-level view of the same scene. The fault ruptures are prominent, but subtle warping of the ground is difficult or impossible to see. The bottom line: earthquakes distort the surrounding volume of rock in complex ways that extend beyond our simpler models of fault slip, and understanding the mechanisms that cause faults to slip they way they do requires detailed documentation of this coseismic deformation field. That is to say, high-resolution topographic surveys (in addition to GPS measurements and remote sensing–e.g., satellite imaging–analysis) allow us to see how faults slip during earthquakes, and how they may do so in the future, crucially identifying things like how they may link together to generate larger earthquakes. For those of you with true scientific interest in the process of earthquake rupture and its effect on landscapes, I recommend actually reading the article. Here’s my somewhere-between-basic-and-technical summary of the findings presented in this paper. Airborne Laser Swath Mapping is accomplished by recording laser pulses reflected off the ground on a sensitive, GPS and gyroscopically oriented instrument mounted on a plane. Rapid measurements (tens to hundreds of thousands of points per second) allow comprehensive and detailed representation of the ground surface and features on it as a geolocated cloud of points in 3D space. First of all, we used LiDAR, which stands for “light detection and ranging” and is accomplished by shooting laser pulses at known orientations to ascertain the distance to solid objects, like for instance the ground. Immediately after the EMC earthquake, a team of scientists with direct and immediate interest in the quake took a helicopter flight over the epicentral region to try and identify which fault had ruptured to cause the temblor. Their aerial reconnaissance identified several major surface breaks along the causative faults of this earthquake, helping pin down the extent of the rupture. Their initial maps were supplemented with satellite-based identification of fault slip in which comparisons of pre- and post-event satellite images revealed major shifts of the ground in opposite directions across the Sierra Cucapah and in the Colorado River Delta. My PhD adviser, Michael Oskin, and colleague Ramon Arrowsmith at Arizona State University leapt at the opportunity to exploit LiDAR to study this earthquake. They appealed to the National Science Foundation for rapid funding of an aerial survey of the rupture zone, and enlisted graduate students (like moi) to compile incoming data on the precise location of fault surface rupture and define the extent of the survey we needed. Getting funding and permission for an airplane to make low, repeat passes collecting high-resolution 3D scans over another country is a logistical nightmare. Generous and enthusiastic collaboration between Mexican and U.S. researchers and government agencies provided a crucial bridge to move forward with the project, and in August, four months after the earthquake, a plane mounted with a laser scanner was taking off from the U.S. to scan the rupture zone. Of course on top of international permissions, there are physical logistics to a mid-summer plane flight over the Sonoran desert, and the mission had a few false starts due to surprising cloudbursts. 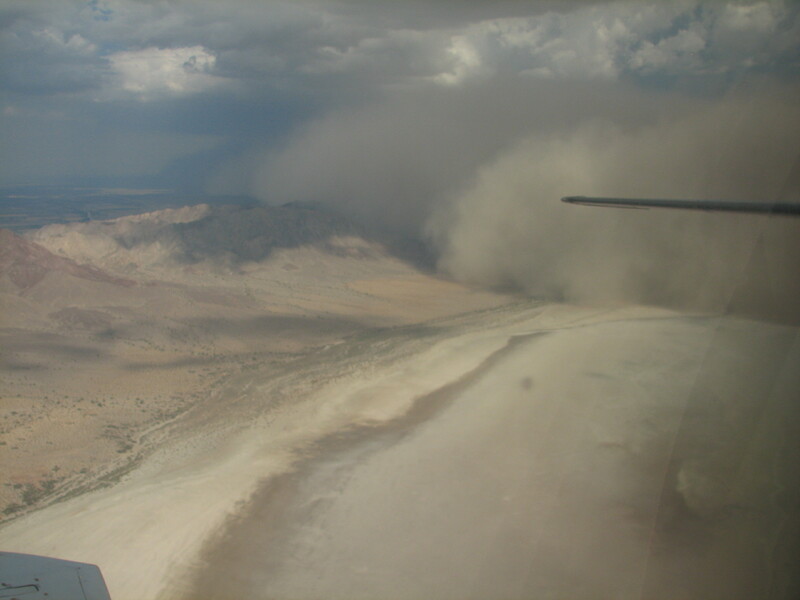 A mid-summer desert downburst chases the survey plane back up to the U.S. for the afternoon. Sand particles and laser range-finding don't mix. Juan Carlos Fernández Díaz of the National Center for Airborne Laser Mapping took this photo as they retreated from the day's flight. The resulting dataset is the largest and highest resolution survey of a large earthquake surface rupture scientists have yet obtained. The raw data and various displayable products (including Google Earth files that I encourage everyone to explore!) are available at OpenTopography.com. The additional key here is that in 2006, the Mexican Instituto Nacional de Estadística y Geografía (INEGI) had conducted a broad, moderate resolution LiDAR survey of the area around the EMC rupture. This meant that we could measure not only the obvious surface breaks evident in the post-event surveys, but the warping and tilting of the ground that would have been invisible to us without some information about its geometry before being disrupted by the earthquake. So voilà! Both pieces came together and we could easily calculate the coseismic vertical displacement of every 5 x 5 meter patch of ground in a 372 sq km swath around the fault rupture. The data showed not only the expected vertical displacements across obvious vertical escarpments, but revealed broad bending and warping structures adjacent to and between the main faults. This warping was apparently occurring in the rock mass around the faults, and not along structures that slipped during the earthquake. 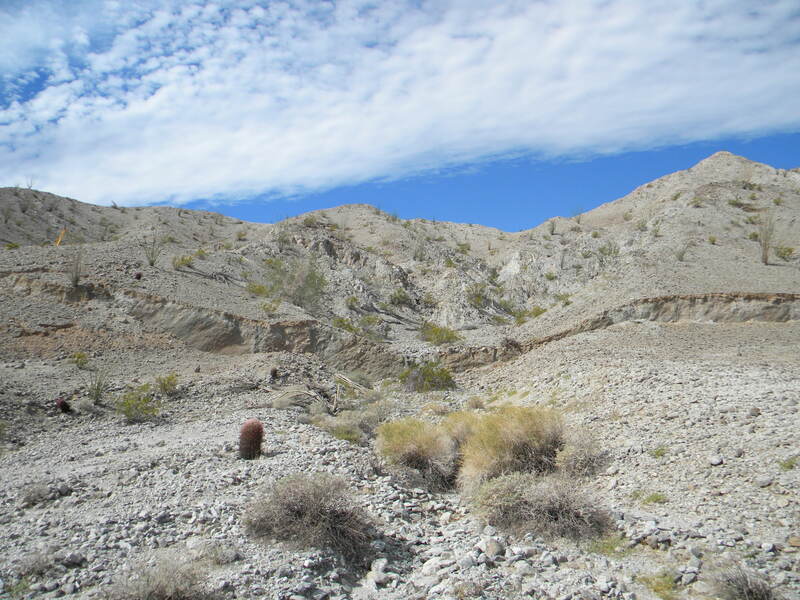 Obvious vertical escarpment, along a structure that slipped during the earthquake: the Borrego Fault. A partial explanation for this observation is the transfer of slip from one fault segment to another. Fault slip in the earthquake should broadly represent a big linear tear in the crust, generating a lobate zone of warped ground where elastic strain that built up before the earthquake was released. However, where the causative fault is discontinuous, slip on one of its segments must decrease to zero and be picked up by the next segment some distance away. This creates a zone of crust that isn’t broken by discrete faults, but has to flex in such a way as to transfer all the slip from one fault across to the other. It is these zones in which we see very high strains, which is unsurprising. 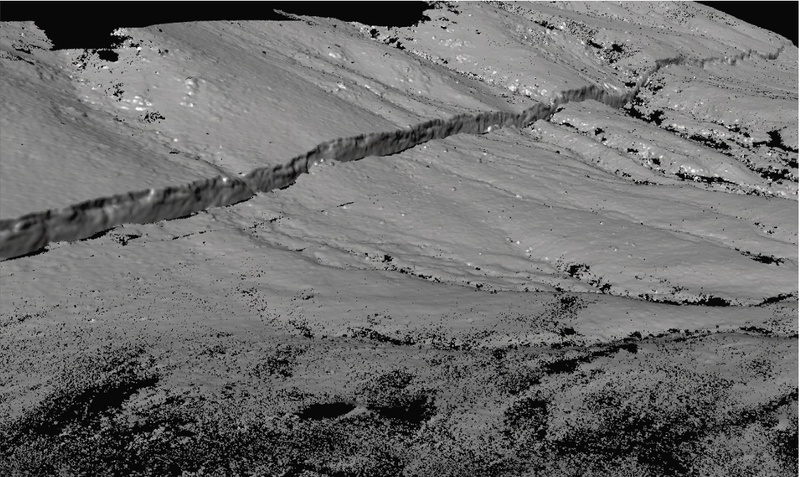 We also see high strains leading away from the faults, where the ground has “sagged” and bent downward in a more complex response to slip on geometrically irregular structures below. The bottom line is that the observed flexing is bordering on extreme for the rock here, and we posit that it’s likely that it can’t stay this way without failing. Because we don’t see observable faults (in the LiDAR nor on the ground) that account for this warping, we infer that if these strains do indeed exceed the strength of the rock–that is if they surpass the maximum amount the rock can bend–then they are being accommodated by distributed yielding: permanent, subtle deformation of the rock volume. To make a colloquial analogy, it’s like when your mother would tell you that contorting your face too much would make it get stuck that way. Well that’s what may be happening to these rocks. That’s where the paper gets speculative, because we don’t know that the strain is high enough to make the rock fail that way and become permanently deformed in this case… all we know is that the strains are that high, and that in cases of other earthquakes, elastic deformation has turned into permanent deformation at strains around this magnitude. In any case, it’s indisputable that a great deal of deformation is happening in the volume of rock surrounding the faults, and not simply on the faults themselves. That’s troubling for people like me who also study ancient past earthquakes, because we’re generally only left with what we can observe on the discrete faults themselves. Subtle warping is difficult to detect in the field, and nearly impossible without precise knowledge of the pre-warping geometry. This may have a huge impact on the assessment of the potential sizes of earthquakes a fault system is capable of producing. By hiding deformation from observable structures, off-fault deformation may lead us to underestimate the size of past earthquakes, and thus to underestimate the hazard for a region. These results also demonstrate that faults can link together to produce bigger earthquakes than we expect. This is something we have observed for a few decades now, in recent earthquakes like the 1992 Landers, CA M7.3 and the 2008 Wenchuan, China M7.9 just to name a couple. Our new LiDAR dataset adds to the evidence we have of faults linking together, and shows us precisely how they do so by capturing the warping of the ground in between them. Despite this rupture’s length and overall linearity, it occurred as a compound event resulting from slip on as many as five separate but related fault systems, linked together by zones of severe warping. The deformation field revealed from these before and after surveys underscores the ability of faults to link together and thus highlights the importance of small faults away from a main plate boundary in the seismic hazard of a region. When datasets like this reveal the mechanisms underlying surface faulting they help us understand how fault slip happens and what its effects are on the landscape. With every new earthquake we know more in advance of the next quake. California is primed to produce a wealth of information from its next large earthquakes, because “before” LiDAR surveys have been flown of nearly all of its major faults (literally starting with the B4 data set). The state is like one big earthquake trap, waiting to record precisely what happens along faults in the next major temblor. I’m privileged to have gotten to work on this earthquake that set the stage. I am privileged to be able to conduct much of my research using an immersive 3D data visualization facility housed by UC Davis. I link there to a clip of the Holodeck from Star Trek because that’s pretty much what this facility is, and I’ve got videos of it below. The future is here; see for yourself. 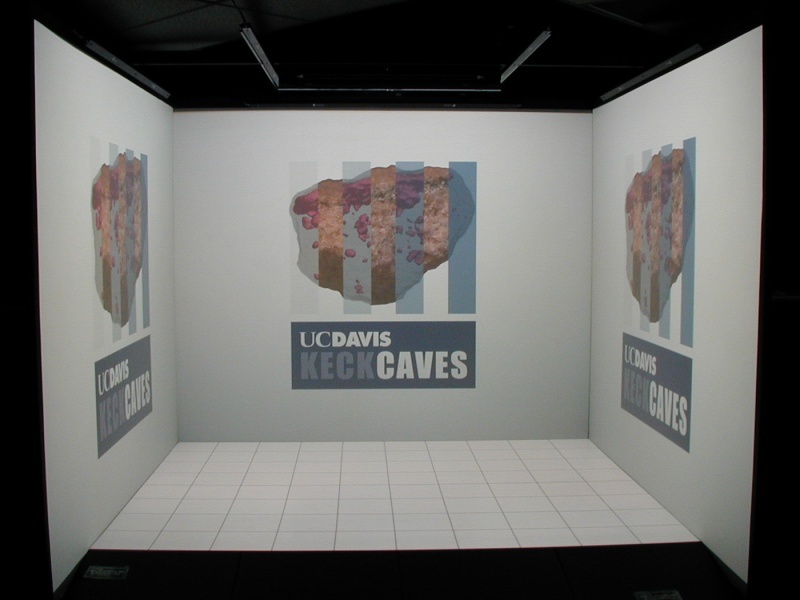 The KeckCAVES (Center for Active Visualization in the Earth Sciences, or “the Cave” as we call it) is a four-sided room (8’x10’x8′) in the geology department that serves as an immersive virtual reality space within which we can load all kinds of multi-dimensional data. The data is rendered in a 3D space, which is projected (in stereo for 3D) onto each of the three walls and the floor. 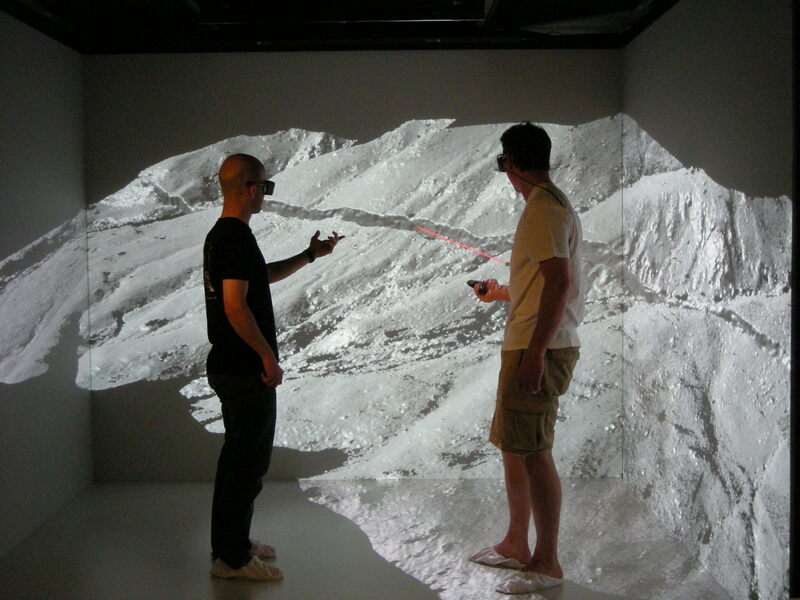 A CAVES user steps into the space wearing a head tracker and a tracked wand–rather like a sophisticated Wii controller–where he or she can interact with and manipulate data as though it’s a real object in the room with him. The 8' high x 10' wide x 8' deep "Cave" room in the Geology department at UC Davis. Each wall displays an image projected from behind, and the floor image is projected from above. Stereo 3D images are projected in space with reference to a user wearing head-tracking 3D goggles. Where my research involves analysis of topography, displaying the data as a 3D model that I can manipulate in space by hand is one of the most enlightening ways of looking at it. Using the CAVES room. Myself (left) and fellow UCD grad student Peter Gold "discuss data results" (read: pose for a promo shot) immersed in a topographic survey we conducted in Baja. Conventional software handles 3D data sets by projecting or slicing them into two dimensions. Practically all of the media we use to communicate is patently 2D, from computer monitors to mobile screens to good old fashioned newspapers and journals, so we’re accustomed to distilling our 3D world down into distributable 2D formats. Indeed computer analysis of data can handle innumerable dimensions, but when it comes to seeing the results, scientists [, engineers, etc.] can be pretty limited. With the burgeoning world of 3D media technology we can go beyond convenient “flat” representations of data and use immersive visualization to pick out patterns that our brains have been geared to look for in 3-dimensions, allowing perhaps more nuanced or informed treatment of the data than computer analysis alone can offer. That’s sort of the selling-this-to-funding-agencies way of saying that simply visualizing data in novel or intuitive ways can be exceptionally informative. Imagine reading a list of driving directions around windy roads versus looking at a map with the route drawn out. Visualization adds some informative nuance (“ah, there’s a big oak tree there!” or “oh, I have to turn because the road ends at a lake!”). So computer scientists in UC Davis’s Institute for Data Analysis and Visualization (IDAV) work cooperatively with geoscientists to develop 3D visualization software that’s geared towards understanding flow in the mantle, topography, geothermal temperature volumes, and serial sections (~CAT-scans) of rocks, among other applications. The primary developer of much of the KeckCAVES software, Oliver Kreylos, is ever branching out and innovating new applications as well as modes of showing his accomplishments. Most recently he embarked on a pursuit that proved rewarding and popular: he hacked the video and depth information out of a Microsoft Kinect and used it to “film” himself in 3D. This endeavor turned out to be wildly popular, so he has continued posting his results to YouTube, including the novel use of two Kinects to fill in shadows and really round out the 3D scene he can capture. This brings me to the main purpose of my post (other than a lot of promo for the KeckCAVES and the folks behind it): we can now use the dual-Kinect video setup to generate footage of users interacting with their data in a 3D environment, which we can “film” (i.e., render into a visual recording) from any perspective within that space. So for visitors to UC Davis’s public expo, Picnic Day, I recorded an explanatory piece about the data I’ve collected for research on last year’s M7.2 Baja earthquake. The explanations will be a little slow for the geologists in the crowd, so just bear with me and marvel at 1) how neat the topographic data is, and 2) the fact that I’m sitting there interacting with a dataset that appears as real in space to me as it looks in this video. The fuzzy halo around my margins is an artifact of the data stream coming from both Kinects as they try to omit my real-world background as I move. 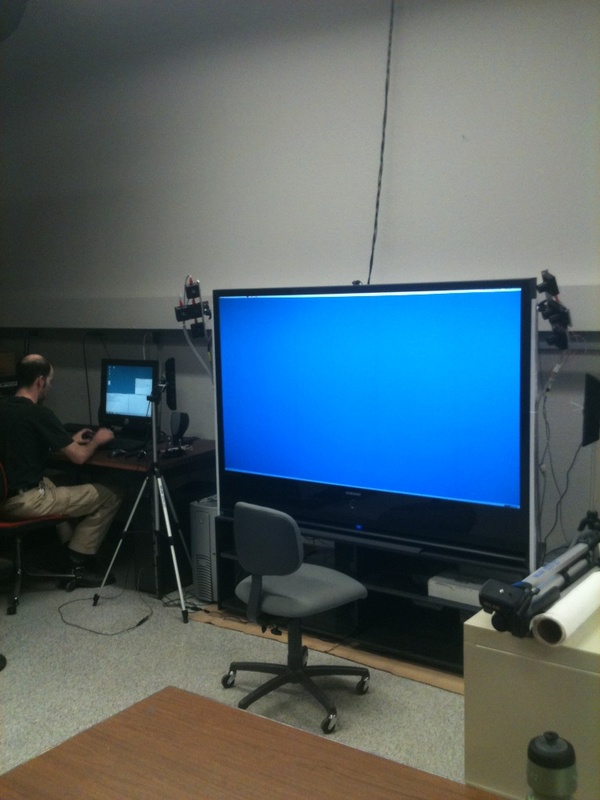 3D TV, tracking system, and two calibrated Kinects. All but the user in the chair are erased to record the 3D virtual reality session in the video above. The astute observer will notice that a couple times during the video I surprised myself by hitting the TV screen, invisible in the virtual space–the 3D immersion is that convincing! There are CAVEs set up in universities, research institutes, and medical labs all over the world. They have a huge presence in medicine and biological research, but the possible applications are quite endless. The ease and intuitiveness of 3D immersion in your data sets is something you have to witness to truly comprehend. If you ever have the opportunity, visit one! I have just returned from three weeks of field work at the site of a rather forgotten but significant earthquake that occurred one year ago last Monday, just south of the Mexico-U.S. border in Baja California del norte. 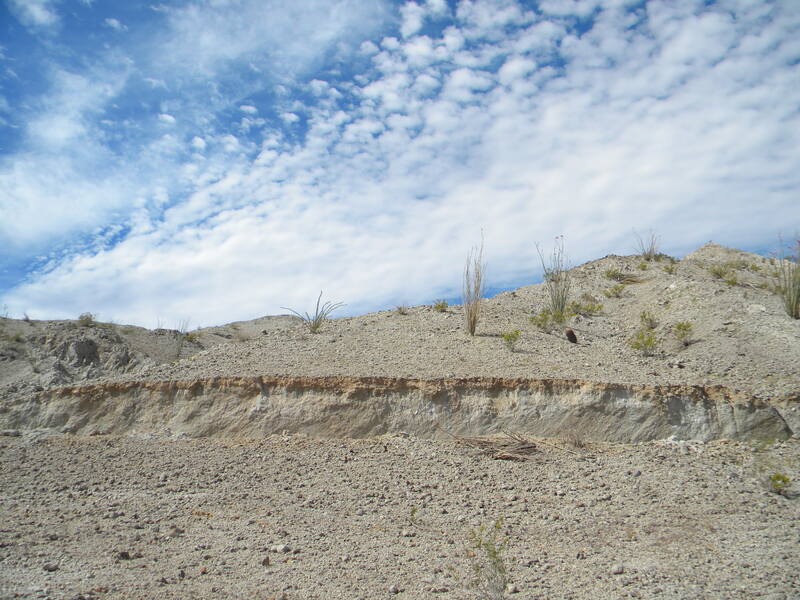 Geologists from UC Davis, University of Kansas, and UCLA admire fresh surface rupture along the Borrego fault in northern Mexico on April 16, 2010. On account of it occurring smack in the middle of a warm, sunny Easter afternoon, it interrupted innumerable egg-hunts, providing a wealth of home video footage from locations far and near. Because of the size of the quake (M7.2), it was felt throughout the desert southwest: Mexicali/Calexico most strongly, San Diego, Tijuana, and Palm Springs of course, then also Los Angeles, Ensenada, Las Vegas, Phoenix, Tuscon, Flagstaff, and so forth. 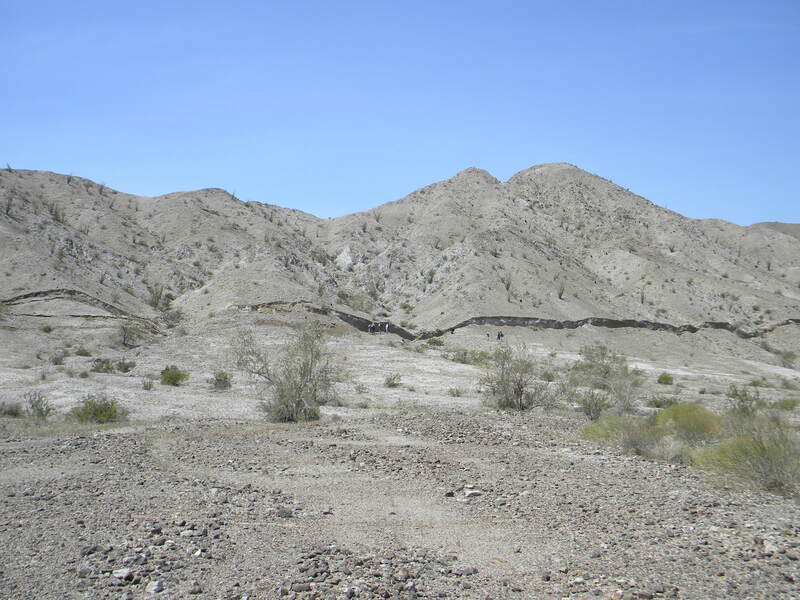 Nevertheless, its location in the deserted mountains west of Mexicali made it a less than significant event to most of the quake-veteran populace of southern California–and no doubt saved countless lives–while leaving a treasure trove of accessible information to earthquake scientists like myself (among many others) to go study. The earthquake ruptured a series of faults, with land to the east generally moving downward and southeastward, and land to the west generally moving relatively upward and northwestward. This makes it an oblique right-lateral rupture (no matter which side of the fault you stand on, the other side appears to have moved to the right), which is more or less what we expect from this portion of the Pacific-North American tectonic plate boundary. Indeed offset features observed all along the fault tend to demonstrate right-oblique slip, as seen in my field photos below, but detailed mapping conducted by a slew of researchers from the Centro de Investigación Científica y de Educación Superior de Ensenada (CICESE), San Diego State University, the USGS, and us at UC Davis (among others) reveal a complex and intriguing distribution of cracks, slip, escarpments, warping, and bending of the ground in a wide swath along the fault zone. Although the magnitude of slip varies substantially with fault geometry and the distribution of cracking, the total displacement across the fault is in the neighborhood of ~3 meters. 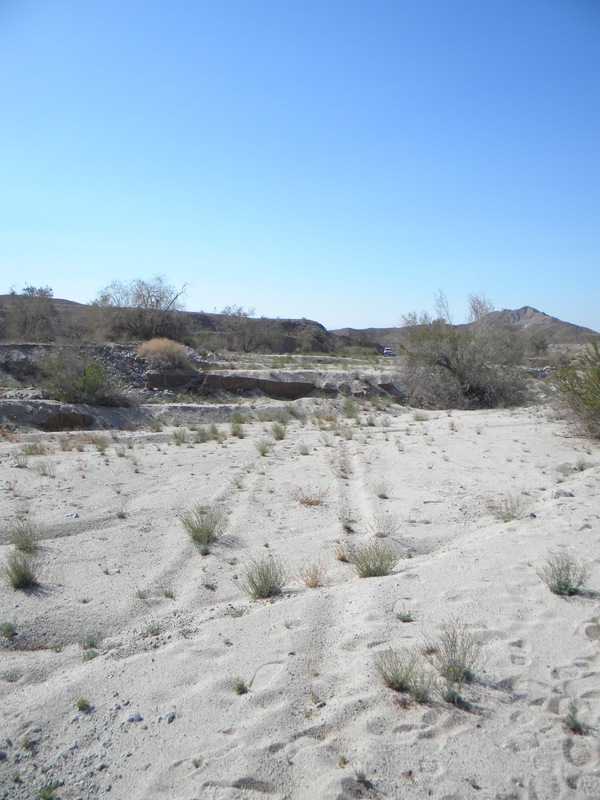 Right-oblique displacement of a steep hillside stream channel across a scarp formed by rupture of the Borrego fault. The scarp here is ~1.5 meters high, about the height of a person. Tire tracks carved before the April 4, 2010 earthquake were offset along with the floor of this wash (we're looking downstream! ), and are still visible in this 2011 photo. Plenty of people are studying the deformation associated with this earthquake, and I’ll post on some of the results as they come out; for now, I’ll describe the goals of my field team when we visit the site of the rupture. The abrupt disruption of the landscape caused by an earthquake leaves a marker to be recorded over time as wind and water smooth, rework, and erode the land. These markers (the scarps pictured above) are what we use to identify prehistoric earthquakes and understand the longterm behavior of faults. Although we recognize that these scarps form instantaneously in earthquakes and erode gradually over the following millennia, we have not recognized this for long enough to document the rate at which it occurs, and so we have a difficult time calculating the age of an ancient scarp just based on its morphology–its shape in the landscape. Thus our group set out immediately following the April 4 earthquake to begin capturing a time-series of topographic surveys of the fresh escarpment, to quantify the rate of erosion. To make these surveys rapidly and with sufficient resolution to identify the small year-to-year changes, we used a ground-based LiDAR scanner, a Star-Trek-esque device that basically scans its surroundings with a laser and produces a 3D representation as a cloud of data points. Topographic hillshade image of the LiDAR point cloud collected by myself and fellow grad student Peter Gold, showing the ~1.5m high Borrego fault scarp slicing across a hillside. The terrestrial LiDAR data we collected (we being Peter Gold and I at UC Davis, under auspices of Dr. Mike Oskin and using the Trimble scanner owned by Dr. Eric Cowgill; and Dr. Michael Taylor and AJ Herrs from the University of Kansas) captured minute features recording the earthquake in the landscape. In the high resolution 3D data we see striations and grooves from sliding along the fault surface, small fissures and cracks away from the main fault rupture, overturned cobbles, uprooted trees, and myriad cross-fault features that were offset by displacement along the fault. This year Peter and I returned with Mike Taylor and his graduate student Richard Styron to see how these features had changed, and whether the scarp had degraded at all during the winter’s rain storms. I’ll leave you hanging there: next post will be a slide show of nifty field photos from this year’s trip, and some of the neat erosional features we found. Happy El Mayor-Cucapah quake anniversary!